Dr. Melamed is a dry eye specialist. Our comprehensive eye exam will do the required tests to judge the degree of dry eye. Dr. Melamed specialized in all dry eye treatments including the very effective Punctal Plugs. Dry eye is a condition in which there are insufficient tears to lubricate and nourish the eye. Tears are necessary for maintaining the health of the front surface of the eye and for providing clear vision. People with dry eyes either do not produce enough tears or have a poor quality of tears. Dry eye is a common and often chronic problem, particularly in women and older adults, but it is a treatable disease. Dry eyes can result from an improper balance of tear production and drainage. Either from Inadequate amount of tears or poor quality of tears. 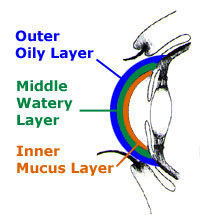 The most common form of dry eyes is due to an inadequate amount of the water layer of tears. This condition, called keratoconjunctivitis sicca (KCS), is also referred to as dry eye syndrome. Treatments for dry eyes aim to restore or maintain the normal amount of tears in the eye to minimize dryness and related discomfort. • Age – dry eye is a part of the natural aging process. The majority of people over age 65 experience some symptoms of dry eyes. • Gender – women are more likely to develop dry eyes due to hormonal changes caused by pregnancy, the use of oral contraceptives, and menopause. • Medications – certain medicines, including antihistamines, decongestants, blood pressure medications and antidepressants, can reduce the amount of tears produced in the eyes. • Medical conditions – persons with rheumatoid arthritis, diabetes and thyroid problems are more likely to have symptoms of dry eyes. Also, problems with inflammation of the eyelids (blepharitis), inflammation of the surfaces of the eye, or the inward or outward turning of eyelids can cause dry eyes to develop. • Environmental conditions – exposure to smoke, wind and dry climates can increase tear evaporation resulting in dry eye symptoms. Failure to blink regularly, such as when staring at a computer screen for long periods of time, can also contribute to drying of the eyes. • Other factors – long term use of contact lenses can be a factor in the development of dry eyes. Refractive eye surgeries, such as LASIK, can cause decreased tear production and dry eyes. • Patient history to determine any symptoms the patient is experiencing and the presence of any general health problems, medications taken, or environmental factors that may be contributing to the dry eye problem. • External examination of the eye, including lid structure and blink dynamics. • Measurement of the quantity and quality of tears for any abnormalities. Special dyes may be instilled in the eyes to better observe tear flow and to highlight any changes to the outer surface of the eye caused by insufficient tears. Dry eyes can be a chronic condition, but your optometrist can prescribe treatment to keep your eyes healthy, more comfortable, and prevent your vision from being affected. The primary approaches used to manage and treat dry eyes include adding tears, conserving tears, increasing tear production, and treating the inflammation of the eyelids. Conserving tears via Punctal Plugs – An additional approach to reducing the symptoms of dry eyes is to keep natural tears in the eyes longer. This can be done by blocking the tear ducts through which the tears normally drain. The tear ducts can be blocked with tiny silicone or gel-like plugs that can be removed, if needed. The goal is to keep the available tears in the eye longer to reduce problems related to dry eyes. See Punctal plug video to the right. Increasing tear production – Prescription eye drops that help to increase production of tears can be recommended by your optometrist, as well as omega-3 fatty acid nutritional supplements. See Restasis Video to the right. Treatment of the contributing eyelid or ocular surface inflammation – Prescription eye drops or ointments, warm compresses and lid massage, or eyelid cleaners may be recommended to help decrease inflammation around the surface of the eyes. Ocular nutrition including proper dosage of Omega-3s have been shown in clinical studies to dramatically help dry eye symptoms by improving oil gland function. Dr Melamed recommends EyeScience Dry Eye Formula. Click photo on left for details on how to order with free shipping.